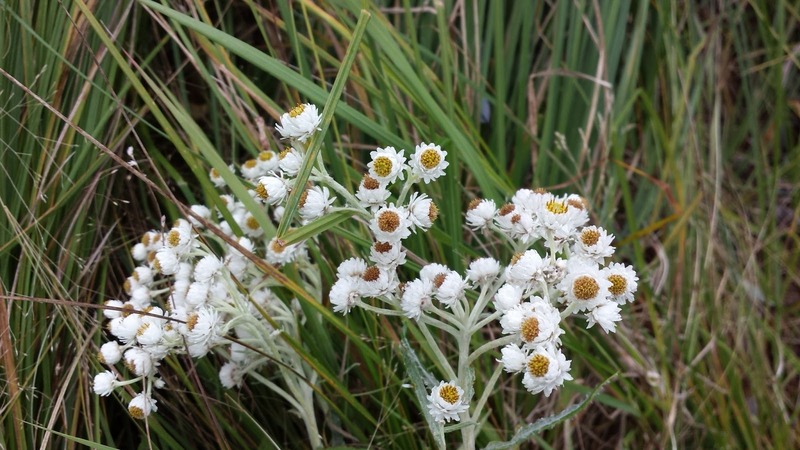 This is the blog for Reed Ecological Design! I plan to discuss organic gardening, native plants, projects, and just about any other ecologically sensitive landscaping topic that comes up. I definitely take requests. Thank you for visiting and for your thoughtful comments. Long overdue but writing this sure is providing nice reminiscing. 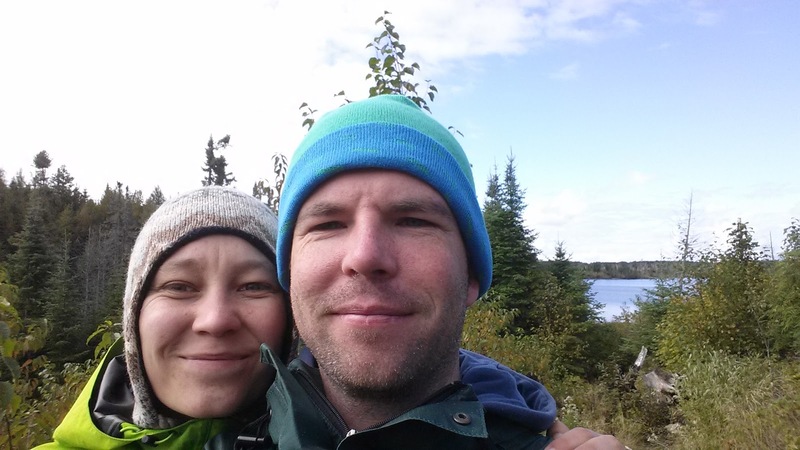 Maria and I traveled to Boundary Waters in early September 2014 for a five day voyage-style canoe trip into the wilderness. 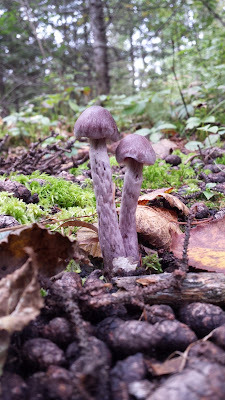 I wanted to share our itinerary and highlights including some of the amazing plants, and fungi, and landscape. This was one of those trips where we researched and planned and started packing more than a month in advance. It was so exciting to finally go! We rented a canoe, paddles, and life jackets from Rockford Lodge and Outfitters on Poplar Lake and began our adventure late morning. Our trip started and ended here. Poplar Lake is a large lake, relatively, and conditions were sunny and quite windy. We paddled south across the lake past a few islands towards our first portage. We almost tipped where the wind concentrated coming around an island. The wind hit us full blast, pushed us sideways, and fortunately into calmer water shielded behind another island. Maria and I were just learning to paddle and communicate about steering! Tipping there would certainly have put a damper on the adventure to come. We possibly would have been too cold and defeated to continue our journey deep into the wilderness. We talked through our steering issue and paddled through successfully on the second attempt. 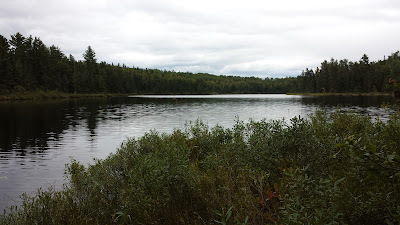 Due to the entry permit restrictions (and, well, me being late reserving a permit), we had to enter Boundary Waters via the 0.9 mile portage to Meeds Lake. We determined on our first portage that two trips would be necessary to carry all our stuff. From Meeds Lake, we portaged via a stream to Caribou Lake and then to Horseshoe Lake. Guess what Horseshoe Lake is shaped like! The daylight was getting short; so we started to look for a place to camp. As reputed, all of the campsites on Horseshoe Lake that we passed were occupied. Looking almost directly into the sunset, we were lucky to spot three moose swimming across Horseshoe Lake. There was one very large head, followed by two much smaller heads. 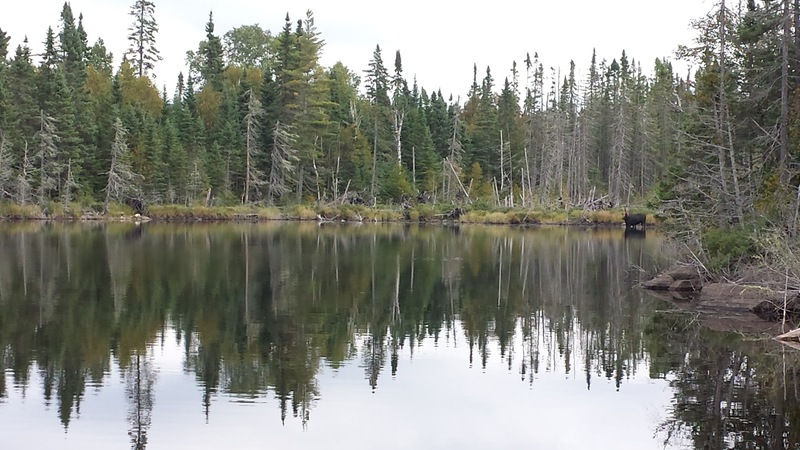 At the last campsite on Horseshoe Lake, we met a man who had come to Boundary Waters to escape his busy life. He was nice enough to share his campsite for the evening...and even gifted some tasty trail food. We saw a number of camping parties on Horseshoe Lake. As we headed deeper into the wilderness, we saw very very few people for the remainder of our trip. ...started out as an overcast and calm day. There was a slight tail wind all day, which made paddling west quite easy. 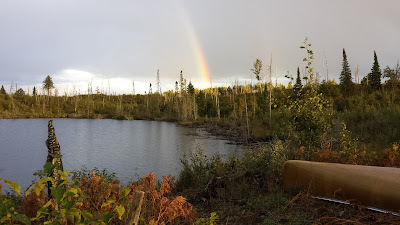 Tuesday was our first full day in the wilderness and we traveled from the southwestern tip of Horseshoe Lake, through Gaskin Lake, through Henson Lake, to Omega Lake. We took our lunch break after portaging to the bank of Henson Lake at its eastern end. It was a very calm day, but as we set there, several large ripples passed by coming from something! We peeked down the shoreline and were able to observe this mama moose and her calf. Quite thrilling to sit there in their presence. 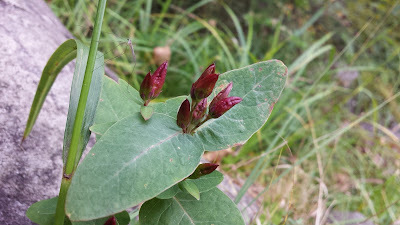 The fruit of Triadenum fraseri, Fraser's Marsh St. Johnswort, in the Hypericaceae family and an unidentified insect. Observed on the shore along of Henson Lake. From Omega Lake, we portaged to Kiskadinna Lake and Muskeg Lake, along a creek, to Long Island Lake. One of my favorite plants, Anaphalis margaritacea, Pearly Everlasting, in the Asteraceae family. This was along the creek. We passed through several areas with recent wild fire activity, the above being one of them. 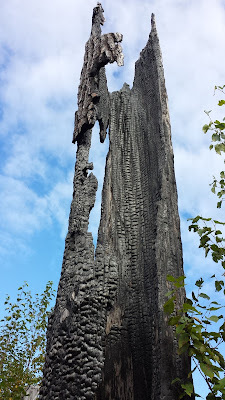 This was on the portage between Muskeg and Long Island Lakes. Absolutely stunning landscape to see. 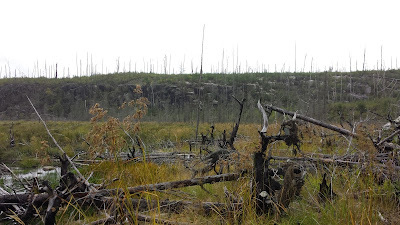 The land just stripped of old woody plants due to a catastrophic level wild fire burn, but totally thriving with native plants. 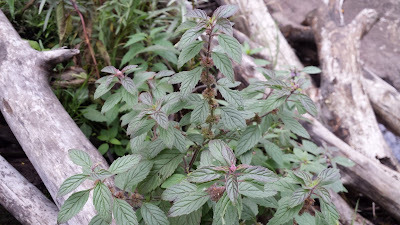 A beautiful plant; possibly in the Mentha genus in the Lamiaceae family. Possibly Mentha canadensis, but I am not confident about that id. 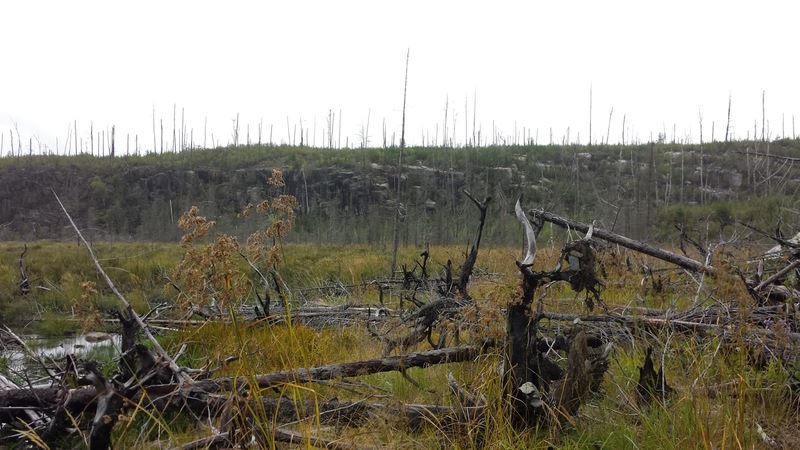 Along the creek between Muskeg and Long Island Lakes. The wind picked up over the course of the day, which mostly was not a problem until we hit Long Island Lake. 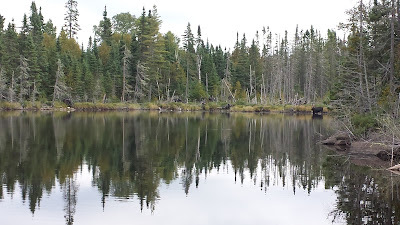 As we floated out of the cove in the southwest corner of the lake, our momentum carried us a bit too quickly into an expanse of the lake and wind, where we did NOT feel safe in our canoe. There were white caps! We tried to keep to an edge, but mostly bared down and paddled hard against the wind across the expanse to a campsite on an island. Fortunately, the white caps stayed out of our canoe! Being that it was windy and chilly, and this was the farthest point of our trip into the wilderness from civilization, this felt particularly risky (and unsafe). From Long Island Lake to Cave Lake (did not see any cave, but I am sure it is named for a reason), to Ross Lake, to Sebeka Lake to Banadad Lake to Rush Lake where we camped in a cove along the south bank. Conditions were cool and sprinkling on and off for most of the day. Passing a beaver damn on Ross Lake. Polypodium virginianum, probably, also called Common Polypody, in the Polypodiaceae family. Observed on the portage between Ross Lake and Sebeka Lake, if memory serves me correctly. 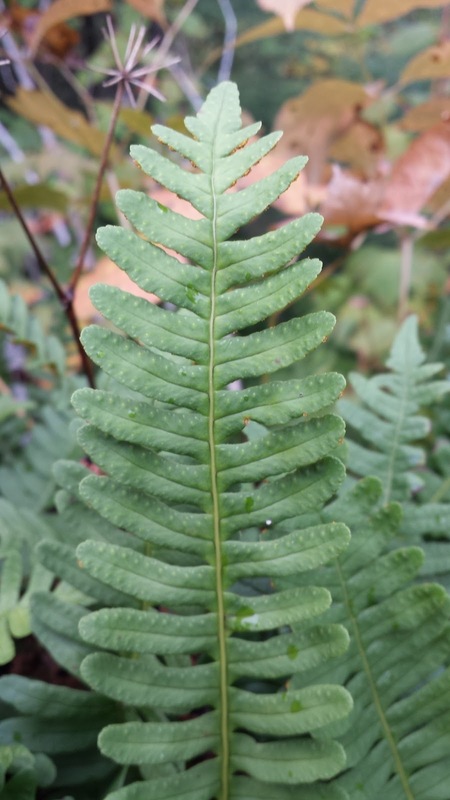 I have plugged the website before, but Ontario Ferns, is an excellent resource for ferns identification. Their silhouettes webpage is most helpful. Sebeka Lake, if memory serves me correctly. 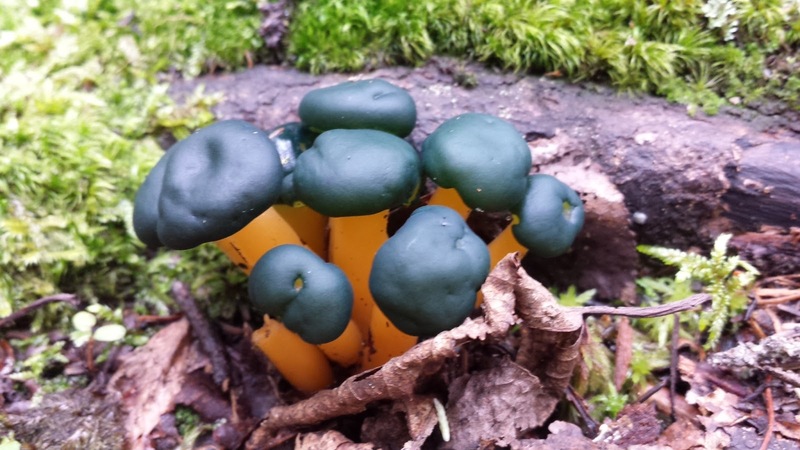 Unidentified fungi, between Sebeka Lake and Banadad Lake. We saw a few of these specimens. The older specimens seemed to be turning into a translucent gu. Unidentified fungi, between Sebeka Lake and Banadad Lake. 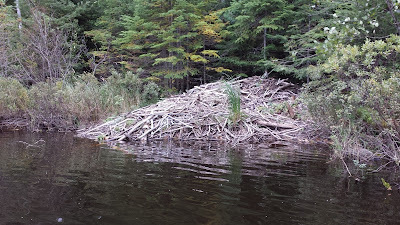 There was an active beaver lodge near our campsite during the evening. It was pretty neat to watch them working. From our campsite on Rush Lake, our evening entertainment. The night was by far and away our coldest night. We warmed up as much as possible by our campfire before retiring. We wore everything we brought and just barely stayed adequately warm overnight. During the middle of the night, we heard the beavers kerplopping with their tails. We wonder what set them off. Probably a fox or coyote, but maybe a mountain lion or black bear. Who knows! We were just trying to stay warm. There was a bit of frost in the morning. We paddled from Rush Lake, through Little Rush Lake, through Skipper Lake, and finally back through Poplar Lake to Rockwood Lodge. We took a number of videos of carrying the canoe and some floating through a lake, but those files are mostly above the size limit for sharing on this venue. We also passed through another wildfire area and got to see the remaining results of the burn close up. These landscapes were so full of life. After five days in, we seem to at least be in good spirits! We were definitely looking forward to being done with our journey. Seeing docks and houses on Poplar Lake as we returned back to civilization was surreal and somehow shocking to my senses. In total, we canoed 25.0 miles and portaged 5.8 miles, more or less. The portaged distances, we traversed three times, due to needing two trips to carry all our stuff. Ugh! Single portaging is definitely worth figuring out. Our pace of paddling was easy. Aside from a couple windy lake crossings and the longer portages, the paddling and the distances never seemed too long or arduous. We took plenty of time to take photos of which we took more than a thousand, some fishing, and lots of wildlife observing. Keep in mind, that for most of the trip we had a tail wind, which certainly made paddling easier. If we were to attempt a similar trip, we would want at least a couple more folks to come along. This trip was super amazing and the landscape was just beautiful. But, we found being in the middle of the wilderness, being so far from people, being so exposed, a fair bit stressful. Nonetheless, was an amazing trip and I wish often that I could go back. All material copyrighted 2014. Simple theme. Powered by Blogger.